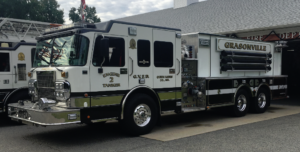 Engine-Tanker 2 is a 2005 Spartan/2017 E-one 8 person enclosed cab. This unit is powered by a 60 Series Detroit 515Hp with an Allison automatic transmission. Engine-Tanker 2 is equipped with a 1250 GPM Waterous pump, 2500 gallons of water, and 30 gallons of foam.